Like pretty much every beauty blogger, I adore MAC eyeshadows but I actually don't own that many instead I have a list as long as my legs (and they're pretty long) of the ones I have my eye on - no pun intended. As you can probably see there's quite a few on my list! Next week, I'm going to be uploading my MAC Lipstick Lust List. I only actually own two and I can't remember the name of them for the life of me, I think one is mulch and the other is like a very light pink one. All that glitters and naked lunch seem to be really popular choices among bloggers especially, I assume because they're so wearable. I adore MAC eyeshadows, the formulas and pigmentation are amazing - I love Sumptuous Olive and Patina is probably my most-used shade! 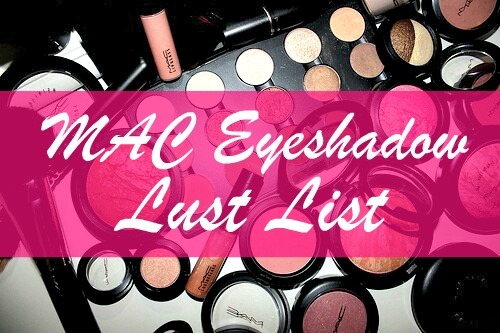 I've done a MAC Eyeshadow Collection post, if you fancy checking that out for some inspiration and swatches!